On Monday, 4th June 2018, Cooperation and International Affairs UMY held Pre-Departure Orientation and Student Gathering. This event was conducted to give an orientation to UMY student who will join a student exchange program at UMY university partners and become a sharing season between the foreign student at UMY. 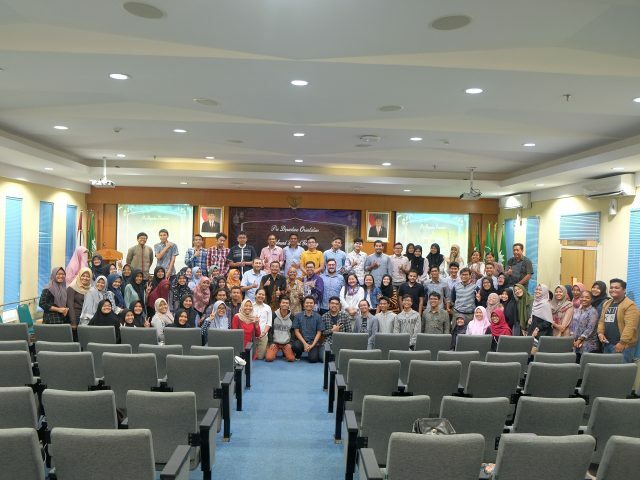 74 selected students from different faculties of UMY and 31 foreign students who joined full-time study and exchange program at UMY gathered at 4th floor, Pascasarjana Building UMY. This event was started with a speech from the head of administrative cooperation of Cooperation and International Affairs, dr Farindira Vesti, M.Sc. She introduced several important things that should be completed by students before their departure, which are collecting the Letter of Acceptance (LoA), having a medical record, obtaining the Visa, holding insurance, contacting the university partner staffs, and booking the flight ticket. The Pre-Departure Orientation was given an orientation before the student departure to their host universities. The student several was given several materials that should know such as a study permit checklist, visa requirements, do’s and dont’s, and obligation during the exchange. The students who attended this pre-departure are the participants of various exchange programs to Universiti Utara Malaysia (Malaysia); Universiti Sains Malaysia (Malaysia), Maejo University (Thailand); Khon Kaen University ( Thailand), SIAS University (Republic of China); Sun Moon University (Republic of Korea), National Cheng Khung University (Taiwan), ASIA University (Taiwan); De La Salle University (Philippine); and many more. After Pre-Departure Orientation, the event was continued with Student Gathering. This event has become a sharing season for the foreign student who studies at UMY. They shared their study’s experiences at UMY. All of the students interested and felt proud to study at UMY. However, the student suggested UMY improve the facilities and give a buddy for the foreign student to help them adapt the social and culture live in Jogja, especially at UMY. Finally, this event closed by did iftar together. All of the participants enjoyed that, especially for the foreign students who haven’t experienced iftar at their country.